ALBUQUERQUE, N.M. — He loved his mom and all that but, well, he was a teenager now and being kissed good night by her just wasn’t in keeping with his advanced age. His mom didn’t buy that. She was among the first to awaken that Nov. 13, 2015, morning, her mother’s home quiet, save for the giggles and cooing of her visiting 6-month-old grandnephew. She thought about Riley, that he had also been a happy baby, that he had grown up to be a happy 16-year-old who woke up with a smile and went to sleep with a smile – and, usually, one of her kisses. She pulled up Facebook on her phone and saw a post from a friend back in Tijeras complaining that the morning – Friday the 13th – was not starting out so lucky. Interstate 40 through Tijeras Canyon was shut down because of a fiery, fatal crash involving a semitrailer and a Honda Civic. What hasn’t been halted is the Heins’ efforts to hold those who caused Riley’s death accountable and to help find ways to prevent a similar tragedy. A second amended complaint filed Sept. 18, 2017, introduced a new defendant – Utility Trailer Manufacturing Co., one of the largest manufacturers of truck trailers, including the one involved in the crash. UTM, which remains the sole defendant in the lawsuit after settlements were reached with other parties, is accused of manufacturing and selling a dangerous and defective product that contributed to Riley’s death. Eric Hein said the focus switched to UTM because of an NPR interview of Marianne Karth and Lois Durso, two mothers who joined forces to advocate for truck safety after their daughters died in separate crashes with tractor-trailers. Like Riley’s crash, they were killed when their vehicles were forced under the trucks’ trailers. These “underride” crashes, as they are known, account for an estimated 300 to 500 of deaths annually, although no official statistics are kept. One of the most notorious underride crashes occurred in 1969 when actress Jayne Mansfield and two others were killed after their car went under the rear of a semitrailer obscured by a fog of pesticides, shearing off the top front of the car. 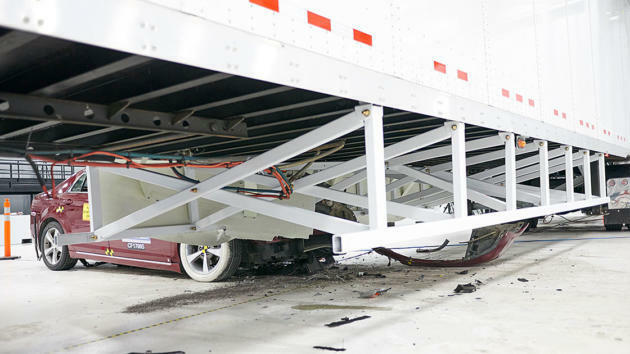 The crash led to the trucking industry’s implementation of rear underride guards, which are often called Mansfield bars. “To date, the federal government has determined that side-impact guards have not been shown to be technologically or economically feasible,” attorneys for UTM wrote in a response to the Heins’ lawsuit. But the happy boy with the constant smile is still a strong presence in their lives. They wear wristbands that read “Release Your Inner Riley.” They see him in the ocean waves near where they now live, in the sunshine that warms a cold morning, in their efforts to save lives, in the besos y abrazos they can only now imagine.